Sometimes you can find a little kailan that looks like a brussel sprout. Brussel sprouts look like cute miniature cabbages (which belong to the Brassicaceae family) and have a slight bitter taste. Little or baby kailan (xiao jie lan) are really overgrown Brussel sprouts I think. I've seen baby kailan up in the cool highlands of Kundasang and they grow along a vertical stem just like Brussel sprouts. Overgrown Brussel sprouts are called "little kailan" in Chinese because they belong to the same Brassicaceae family as the large leafy kailan. 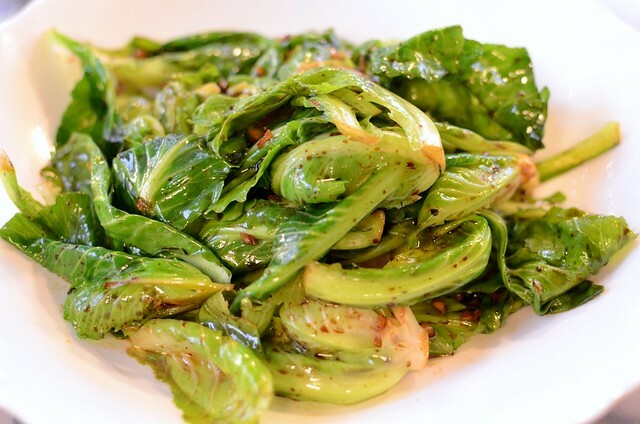 Overgrown Brussel sprouts are crunchy, tasty and especially good when blanched and then stir-fried. 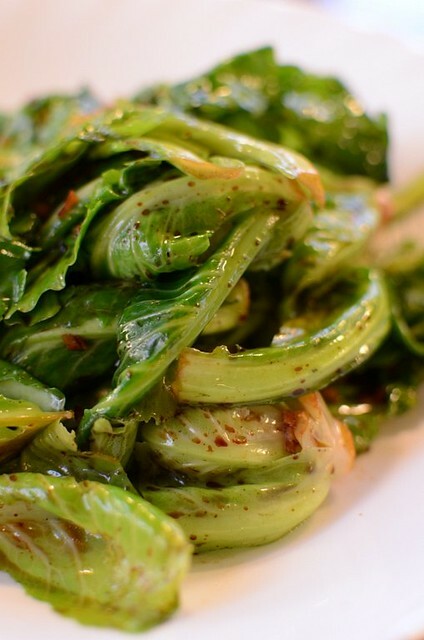 Blanching cooks and softens the kailan and stir-frying improves the flavor. When our kids were younger, my friends Sucy and Yo and our families used to go on weekend trips by the coast or mountains and on one of those trips, Sucy taught her maid to improvise the cooking of little kailan using the only two seasonings available--dark soy sauce and garlic-- in the kitchen of our rented chalet. Yes, we had the luxury of bringing along her maid to cook and wash on such trips. The excuse was that someone had to cook while we looked after our kids. The plate of baby kailan Sucy/her maid cooked was so good, I only cook baby kailan that way since. The only thing I do differently is toss the sauce with the kailan in the wok whereas Sucy poured the fried garlic soy sauce over the blanched kailan on a plate. I find that the extra step of tossing the kailan in the wok helps to get the sauce into the veg and also gives the veg a blanched-fried taste rather than just a blanched taste. 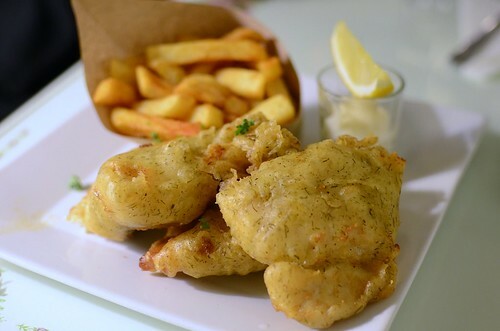 Do not skip the step of frying the garlic and sauce in oil. Blanching veggies in water to which oil has been added, the usual way of blanching veggies Chinese-style, gives a lighter, less fragrant taste while oil that has been heated ('cooked oil' in Chinese, a very Cantonese ingredient that improves the taste of delicate dishes from steamed fish to tossed noodles) gives a fragrant and cooked flavor versus the raw flavor of uncooked oil. Btw, you can cook most leafy veggies this way but make sure you don't overcook them. 1. Remove any wilted or yellow outer leaves from the kailan, cut off excess stem ends and half them lengthwise so that they'll cook faster. Wash very well under running water and then swish the veg in a sinkful of water to remove the dirt caught between the leaves. Do that twice. Drain in a colander. 2. 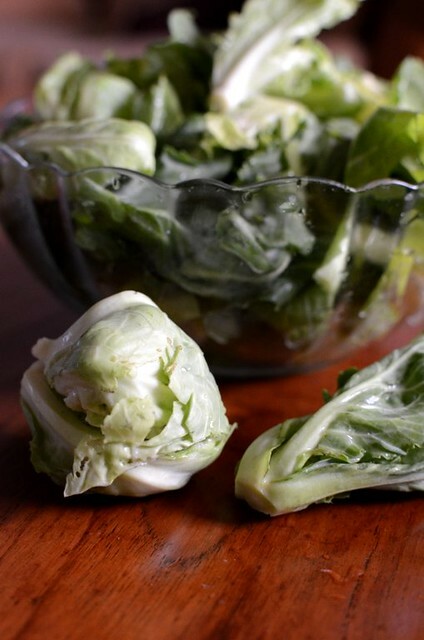 Boil enough water to blanch the kailan until they are just wilted and still very green. Remove with a large slotted spoon into a colander, tapping the colander to remove as much water as possible. 3. Heat up a wok, add 2 T veg oil and the garlic and fry (low temp) until garlic is slightly golden. Add the oyster sauce and dark soy sauce, stir well for 10 to 20 seconds, add the well-drained kailan (any excess water will dilute the taste) and toss to mix well. Remove onto a plate. Alternatively, pour the fried garlic sauce over the blanched kailan. I love this recipe. Dry ingredients in one bowl, wet ingredients in another and then mix the two. The ganache was to be whisked too, for a fluffier frosting, but I couldn't wait. Besides it was one of those times when I wanted a gooey shiny dark frosting. This cake is soft without being chiffony, very moist, devilishly chocolaty and wonderfully scented with the natural essence of bananas. I served it as an American sheet cake, one layer with frosting. It was a big hit even with my Fussy Eater. The second time I made the cake, everything went wrong. I couldn't get Valhorna cocoa powder or dark Lindt chocolate and I ran out of self-raising flour (the original recipe called for plain flour but I made the first cake using SR flour) because I doubled the recipe last minute as I had a lot of ripe bananas. Then when the ingredients went into the bowl, I found that I didn't have enough sugar too and in the heat of the afternoon, I didn't want to rush out to get it so I carefully removed 1/4 of the recipe amount and prayed for the best. Of course it didn't work, especially when the cake tin was too small for 1 1/2 recipe amount. The cake took 1 hour 20 minutes to cook, resulting in a dry, slightly bitter and coarser cake. And I had to serve it to guests whom I really wanted to impress! I don't know if that happens to you but it does to me, all the time. What I've learnt: use the best ingredients and the right cake tin and do not reduce the sugar amount beyond 1 1/4 cups for one recipe because the large amount of cocoa powder can make the cake bitter, fine if you like bitter chocolate like we do. As for the bananas, if you can only get those perfect Del Monte bananas, too bad for you. 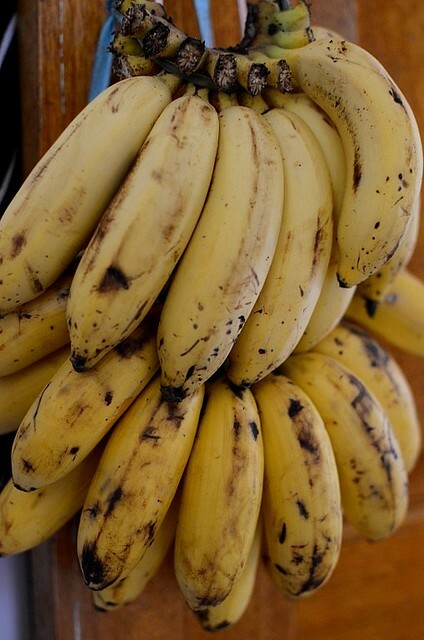 Those beautiful, flawless-skinned but bland and boring bananas are the reason why some people dislike bananas. 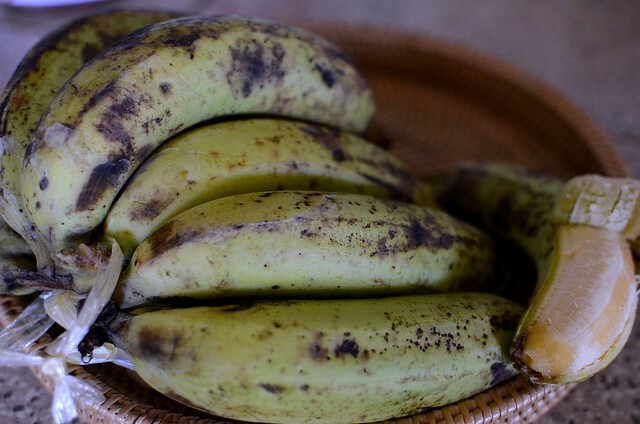 Grown by the hundreds of hectares and because they need to be shipped out, those perfect bananas are harvested when still very unripe whereas the local bananas are cut nearer to their ripening stage. Most bananas here are grown commercially too but on a very much smaller scale. There are dozens of varieties of bananas here, each with a slightly different flavor, texture and appearance. 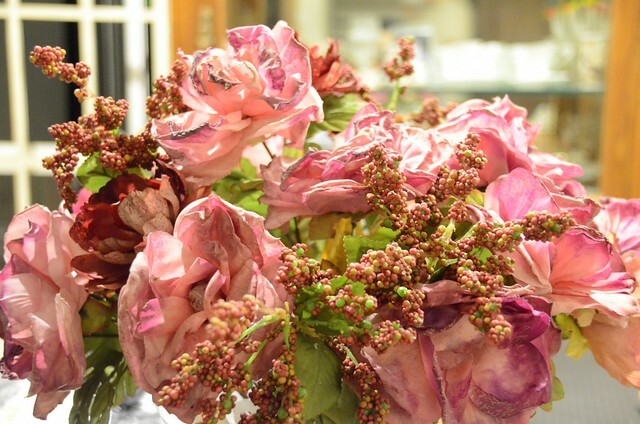 They are usually mottled and speckled but I think that gives them character. I love the green-skinned bananas that are extremely fragrant and green even when ripe (the greener the sweeter), the popular sweet pisang emas (golden bananas), the sweet and smooth pisang raja (king bananas) and the 'powder bananas', which have silky-smooth sweet flesh and smooth skin that look powdered but are less suitable for baking because of the weaker flavor. Berangan bananas are now the most easily available variety of bananas in KK and I dislike them because despite good flavor, they are very dry. This recipe was from The Joy Of Baking. The recipe makes great cupcakes too and the frosting for that is a butter cream instead of a ganache. 1. Oven at 180 C. Grease a 9" x 11" or 9' x 13" rectangular pan. 2. Sieve the flour, baking powder, baking soda and cocoa powder into a medium-sized bowl. Add the sugar and mix well. 3. Put the mashed bananas, milk, water, oil, eggs and vanilla into a large bowl and whisk with a hand whisk until well-blended. 4. Put the dry ingredients into the wet and mix well. The mixture will be very runny. 5. Pour into the baking pan and bake about 40 to 45 minutes for the 9 " x 13 " pan or 50 to 55 minutes for the 9" x 11" pan. Stick a wooden skewer into the center of the cake and if it comes out clean, cake is done. Do not overbake. Cool completely in the tin and turn out when cooled, or you can leave it in the tin and frost it that way. 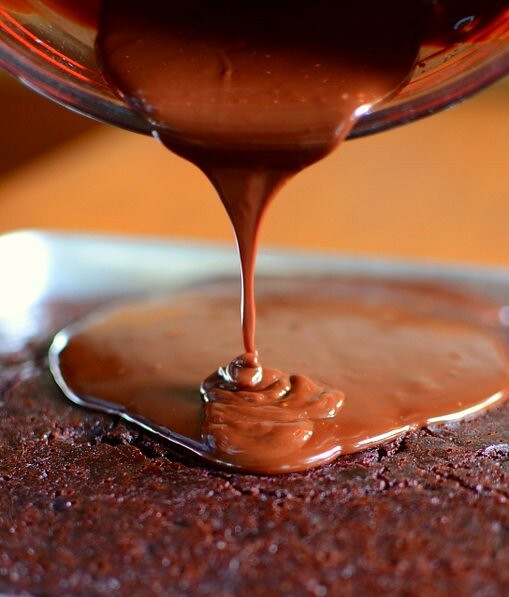 --Put the choc into a heat-proof glass bowl and place the bowl over a small pot of boiling water. When the choc begins to melt, add the cream and the butter, stirring until all the chocolate is melted. Remove from the fire. When still warm but not hot, pour over the cake. 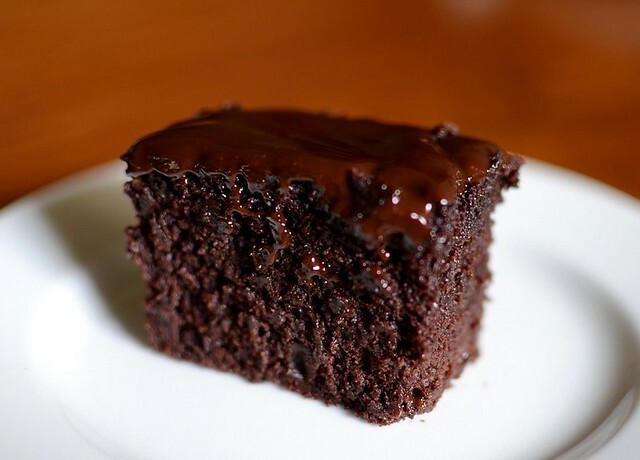 If you want a fluffier and more voluminous frosting, cool the ganache completely and then whisk until light and fluffy. Spread over the cooled cake. *original recipe is 1 cup/120 gm. 1. Melt the dark chocolate in a bowl over simmering water. Cool. 2. Beat the butter with a hand-held whisk until smooth and creamy. Add the icing sugar and beat until light and fluffy. Beat in the vanilla and the melted chocolate until smooth and glossy, about 2 -3 minutes on medium speed. 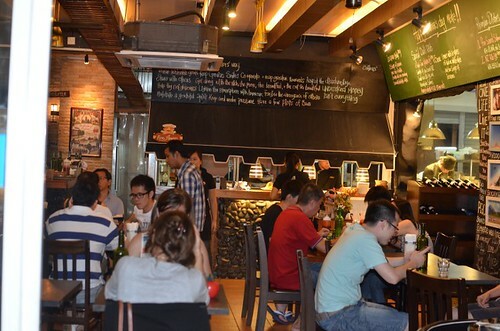 Pipin is the family name of the sino-Kadazan families who own the restaurant. 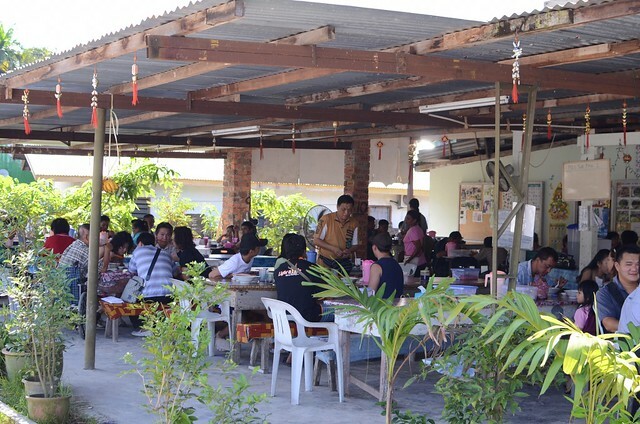 The Kadazans are the natives of Sabah and their integration with the Chinese and their Christian roots (most are Roman Catholics) resulted in a cuisine that's both native and Hakka-Chinese, and pork is the favored meat. Most people seem to go to Pipin for the pork noodles but I prefer their beef noodles. The restaurant is really two, not one. The original restaurant operated along the Moyog River with no permanent structure and shade was from the jungle trees, giving a jungle picnic ambience. The family moved to the present location and operate from their houses now. 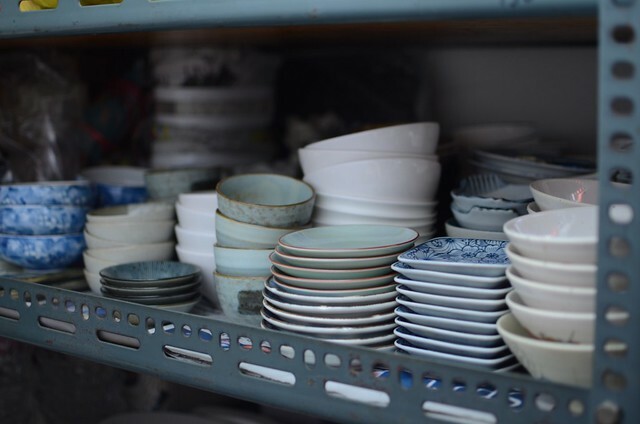 The brother operates the smaller house while the sister the bigger house but the menu is the same: pork offal noodles, beef offal noodles, fish slices noodles, stuffed tofu and a few other dishes. 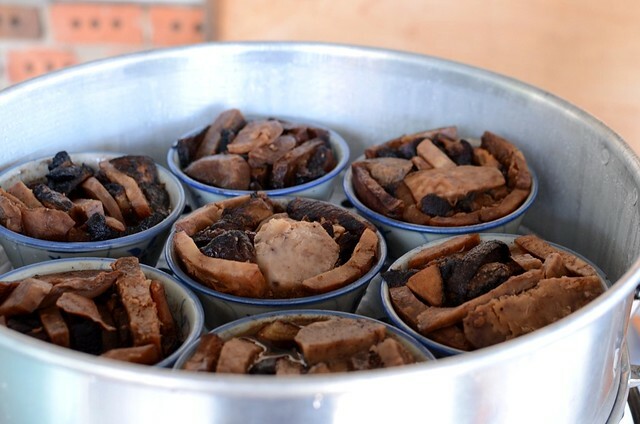 On weekends, the place is crowded (food's served under the 'patio') and besides the regular fare, there's pork slices with taro, steamed pork buns, stewed chicken feet and lots more. On weekends also, a table is set aside for any harvest from the garden or jungle. On one occasion, we bought two bundles of bak choy and sent them into the kitchen for cooking, a service which cost us RM2/USD0.74 only. If anyone around that area slaughter a pig that weekend, it goes on the stall table too and last week I saw the freshest pork ever, shiny and pink. Beef offal (ngew chap) noodles is one of KK's top food and there are so many versions of it that I am too daunted to blog about it. 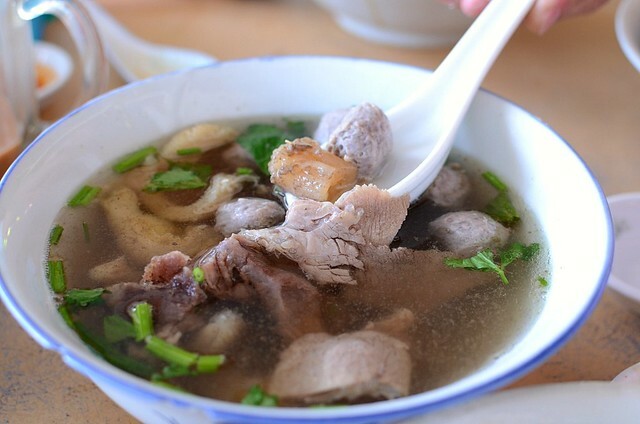 I swing to and fro between the richer, darker and tastier stewed beef offal soup to the lighter and more refreshing one. 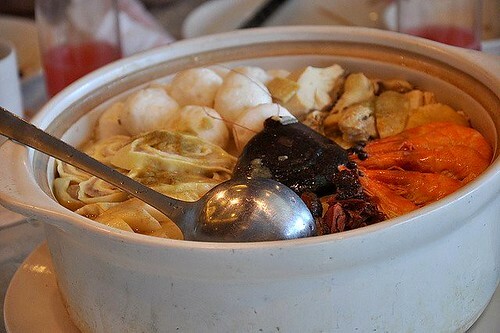 There are in-betweens too, like the appetizing Hainan ngew chap which has salted veg as a topping. Pipin's ngew chap is of the lighter version and reminds me of the original ngew chap once served under the big rain trees in Kasigui. Pipin's beef balls are tasty and bouncy albeit tinier than most beef balls. The only complaint I have about Pipin's pork and beef offal noodles is that the offal is cut too thin, especially the belly meat and the tongue. I find portions are bigger on weekdays. I love Pipin's stuffed tofu, which is big and tasty at RM1/USD0.37 per piece. The sauce is just nice without smacking of msg. 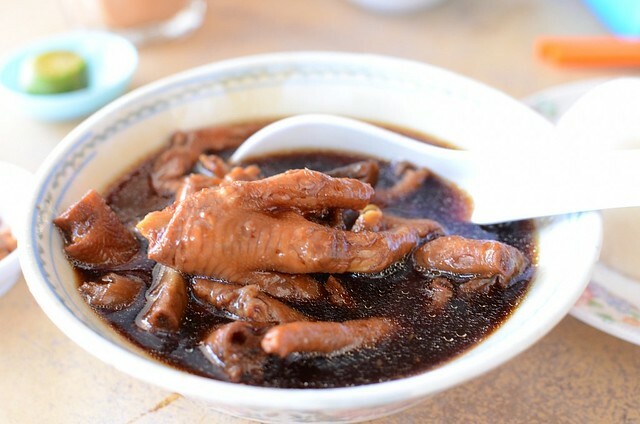 These stewed kampung (village) chicken feet are bony and not deep-fried, unlike those in the city which are bigger and puffed from frying. 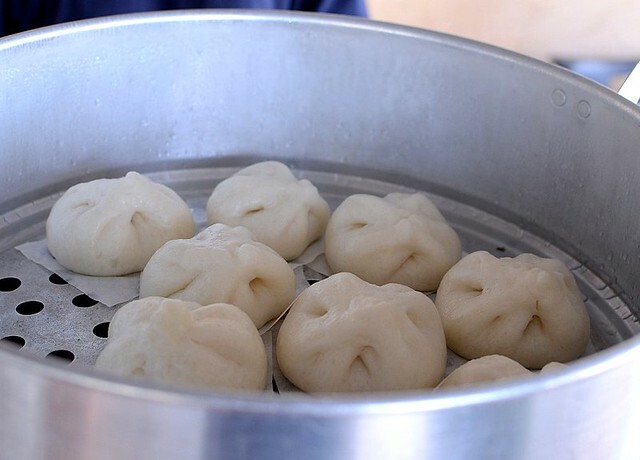 These steamed buns (RM1/USD0.37) look just like mine so I know they are home made and not laced with preservatives and additives. Hakka belly pork with taro (kew nyuk), RM15/USD5.50. 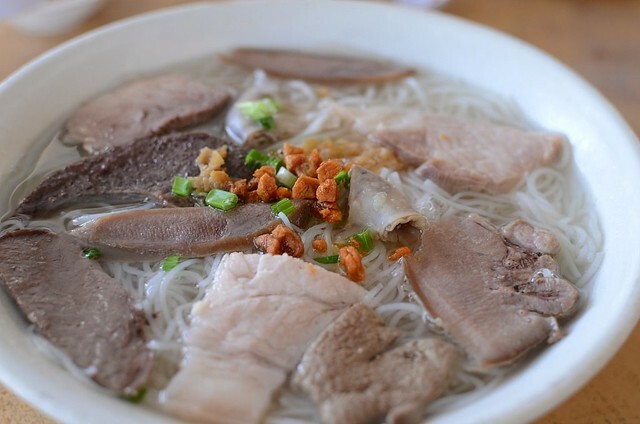 Pork offal soup with rice noodles. To get to the restaurant, head for the road to Tambunan from Dongonggon. After about 5 minutes, you'll see the signboard for St Theresa's Church on the left. 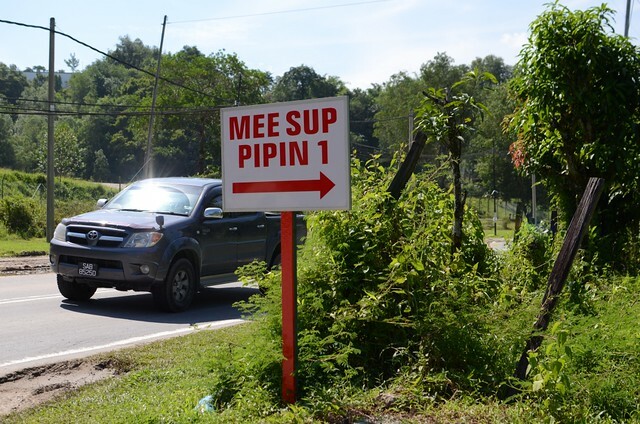 Go further up, about 3 to 4 minutes, and you'll see a small white signboard on the right that says 'Mee Sup Pipin' in red. Turn into the dirt road and there's a choice of left, straight ahead or right turn. Take the road that's straight ahead; you'll find yourself almost driving into the house. That's the smaller house where pork offal noodles are served weekdays only so turn to the left and go to the bigger house where you get everything on weekends but on weekdays, you get beef and fish noodles only. However, they do bring the food from the other house so you can have pork noodles too. One more thing. They always hang a comb of home-grown bananas near the tables and those are free. The ones hanging near the kitchen are for sale. Go on, take the family out for a ride into the country and have a bowl of noodles with very fresh meat and offal and soup that's not saturated with msg. I'm not sure about the prices but they are lower than those in the city and portion is just right. Maodou means 'hair/hairy beans' in Chinese. 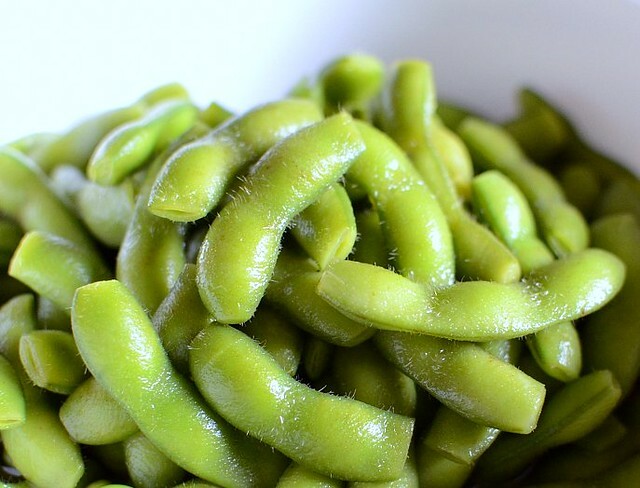 The Shanghainese, like the Japanese, love green soybeans (maodou in Shanghainese, edamame in Japanese). 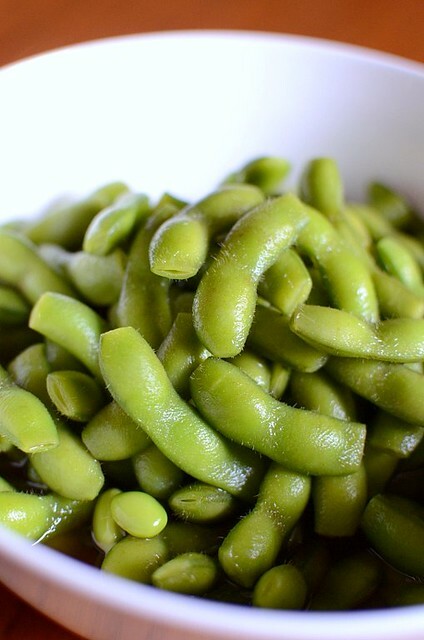 If you go to a Shanghai market in the summer, you'll find lots of green soybeans, in their pods or shelled. 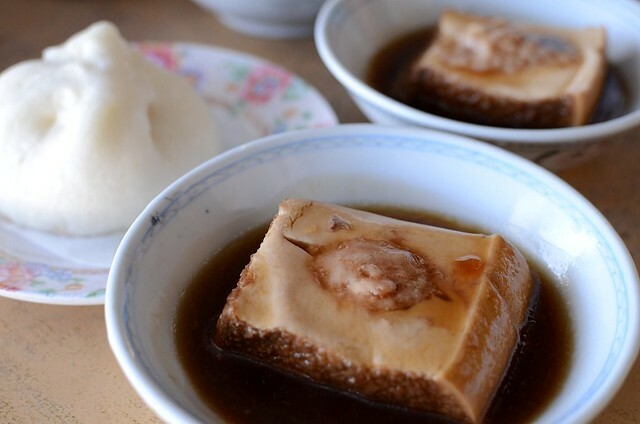 Green soy beans are usually shelled and fried with preserved veg called xuecai and tofu sheets called bai yeh while the unshelled beans are boiled and soaked in zaolu (wine made from leftover sediment of rice wine) and served chilled as an refreshing snack or appetizer. Every time we are in Shanghai, there's a large bowl of drunken maodou in Eldest Aunt's fridge or on the tables at the restaurants. If you get fresh maodou where you are, lucky you. Maodou are packed with protein and nutrients so make them part of your diet. You can fry the shelled beans like I did here or boil them with salt Japanese style or soak them in wine Shanghainese style. 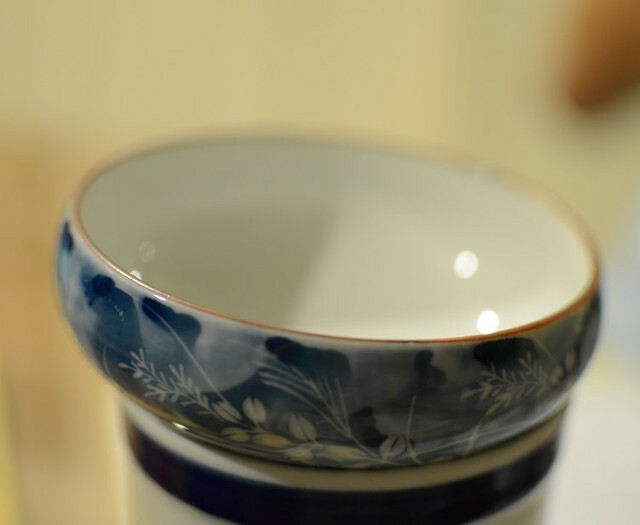 I can't get zaolu here, so I use Shaoxing hua tiao wine which is a pale substitute to the intensely aromatic zaolu. This recipe is adapted from here. 1. Snip both ends of the maodou for the wine to soak in. Boil the beans in a pot of water. Some like the beans soft but I like them quite raw so for frozen beans, one minute of boiling is good but boil longer if beans are fresh & unfrozen. Remove the beans with a sieve or scoop and plunge into cold water to stop the cooking and to keep the beans green. 2. Pour away all but one cup of the boiled water and add the spices, sugar and salt. Boil for 3 to 5 minutes. Cool. 3. Add the wine to the spiced water and pour that over the green beans. Cover and leave to chill in the fridge for at least 8 hours or overnight. Turn the beans once every few hours to get even soaking. Usually we have Father's Day dinner with my in-laws and my mom but this year they decided they didn't want to bear the crowded restaurants so just the three of us went to Sailors, above Baba Nyonya Restaurant at Millennium behind Rainfield Court apartments. I was very impressed the first time I was there, for lunch, in early April. Portions were BIG, prices very reasonable and the food was good. I had the Thai beef salad while Yi had the lamb chops. 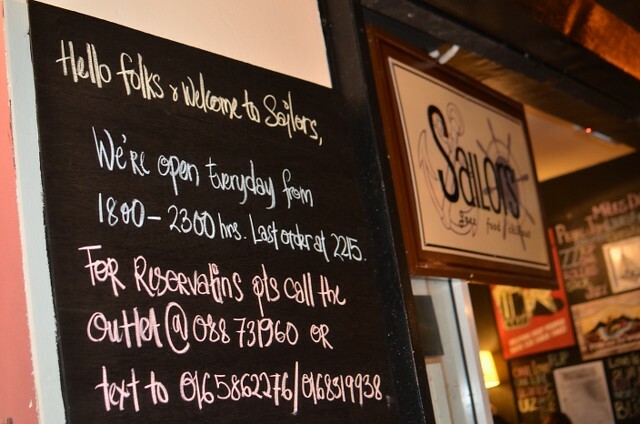 Sailors closed for expansion renovation in April and still hasn't settled down so the restaurant won't open for lunch until August when they will have a bigger menu. The decor is a little bit much for me--a cutesy corner for books and cards, a shelf of high tea trays, a doorway of painted rocks, paintings that remind me of cross stitch in the 80s and busy walls of cheap art. Wey said it looked like the inside of many homes which can be either good or bad when you think about it. I enjoyed the What-A-Wonderful-World kind of music, he hated it. Music for old people, he said. We didn't have reservations and on such an occasion, restaurants were all full and Sailors was no exception. We were lucky to be ushered to a reserved table and the food started to arrive after only 10 minutes' wait. What a difference a renovation makes. Thai beef salad is no longer on the menu so I opted for the Cajun chicken salad (RM9++/USD3++). As you can see, the portion was small, salad was all lettuce and the few bits of chicken--about a tablespoonful--didn't taste Cajun. We each had a bowl of mushroom soup (RM5++/USD1.60++), the only soup available. It was good with lots of shiitake mushrooms. Wey somehow ordered a bacon and cheese omelette for dinner. 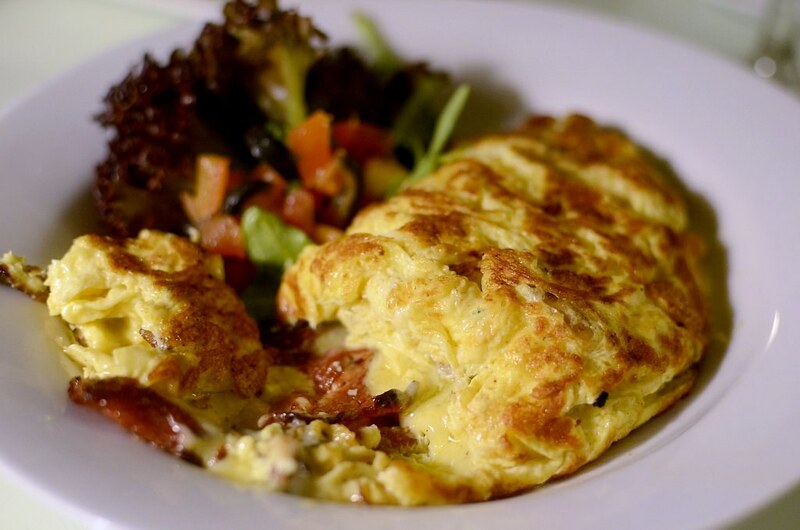 Omelettes are omelettes, nice but not exceptional. I can't remember how much this cost. A growing boy needs to eat like one. Wey has this strange habit of checking out fish and chips (RM15++/USD5++) in new restaurants even though he avoids eating fish most of the time. He wasn't impressed with this and neither was I . 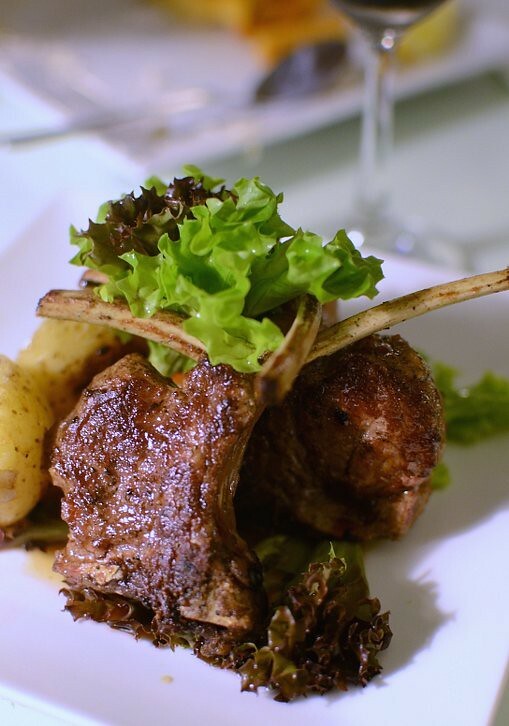 My rack of lamb (RM39++/USD13++) came overcooked. I assumed that lamb would come slightly underdone and the waitress didn't ask. 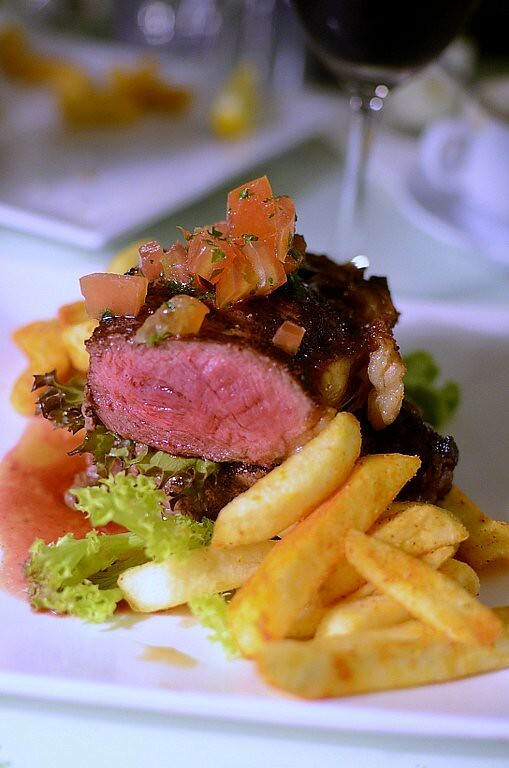 Hub's sirloin looked good, done just nice and taste was okay but surprisingly was dry inside--sign of a frozen steak. RM47++/USD15.50++. 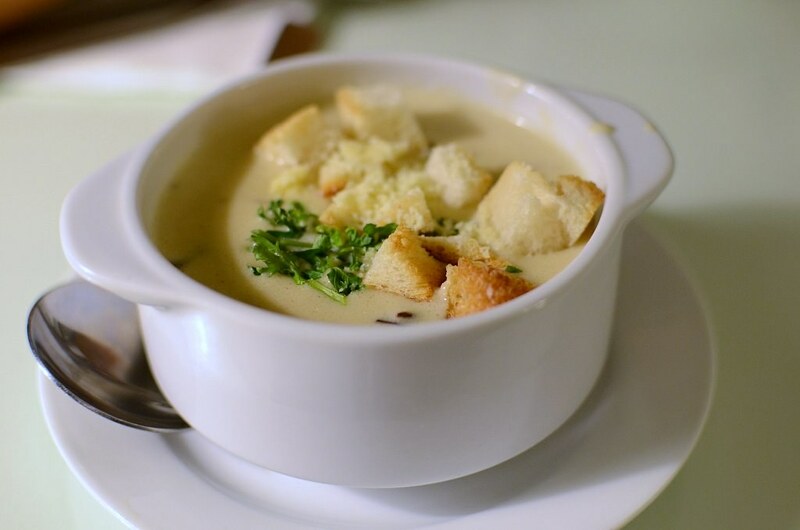 Wey ordered another soup and garlic bread (feeding one growing child is a lot cheaper than 3, I just realized) but it didn't come after a long wait so we left. Desserts on the other tables didn't look appealing, mostly ice creams of vibrant colors which I've learnt from my Italian holidays are just that, colors. Overall, the food tonight could've been better but because the prices are very reasonable compared to most other similar western restaurants in town, I'd still come back. Since the portions have shrunk, I'd go for the RM15/USD5 deals such as lamb chops, house burgers, grilled chicken, chicken fritters, fajitas and rice dishes. 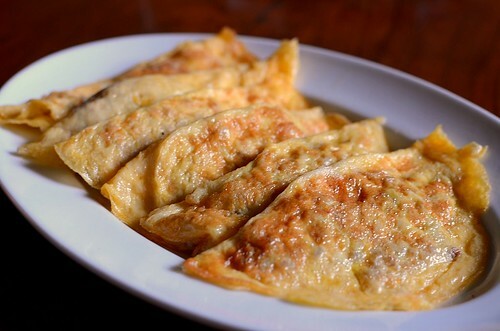 Growing up, I loved my mom's jin dan gok (pan fried egg triangles) which are mini omelettes with a filling of ground meat, usually pork. My MIL used to cook a soupy version of egg triangles with veggies for her MIL who didn't have much teeth power left. I prefer the dry version which is tastier. According to Hub, his mom's soupy egg triangles dish is a simplified version of a fancy Shanghainese casserole of many kinds of meat and seafood. In the pot of goodies in this photo, the egg triangles were made into egg rolls (on the left of the pot). The minced meat can be cooked beforehand and just before serving, fry the omelettes so that they get to the table piping hot. You can douse some dark soy sauce over. Goes very well with rice and kids especially will love this. I'm thinking as I write this, that for extra flavor, you can add finely chopped preserved veg (tung choy) or preserved radish (chai por) or chives or spring onions to the meat when frying. In fact, feel free to add some green peas or corn if that's one way to make the kids eat more veg. 1. Add a pinch of salt and some white pepper to the eggs and beat well. Season the meat with a pinch of salt and white pepper. A few drops of light soy sauce and sesame oil can also be added if like. 2. Put 1/2 T veg oil into a frying pan or wok and fry the meat at low heat, stirring well to break up and separate the meat, until cooked. If you want a moist mince, mix 1/2 cornflour and 2 T water and stir into the meat, stir-frying for 20 seconds more for the cornflour to cook. Remove and cool. 3. Heat up a clean wok or frying pan and add 1/2 T oil. Pour in 2 T of the beaten egg and when the edges begin to bubble and cook, swirl the pan or wok to spread the egg into a wider circle, like a thin crepe. 4. Quickly put 1 T (put more if you like the triangle to puff up) of the cooked meat on one side of the egg crepe and use a spatula or ladle to flip the other half of the egg crepe over to cover the meat, so the egg crepe is now a semi-circle. Fry the other side too until lightly golden. Remove and repeat with remaining egg and meat. Serve hot with rice. 5. Cooking with veg: Put some oil in the wok and fry the veg. Add some salt and 1 cup chicken stock to the veg, slip the fried egg triangles onto the veg, digging the veg apart so that the egg triangles are immersed in the liquid. Cover and simmer 2 minutes. If there's too much liquid, put the fire on full blast to reduce the liquid. Dish onto a plate and serve immediately. 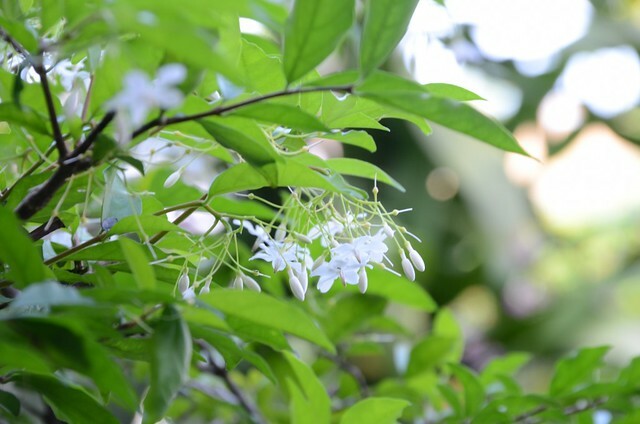 Yes, there is such a thing as too much bokeh. While photographing a single object with the 35 mm lens is fine, a plateful of food is more tricky because I'm not sure exactly where to focus. Anyway, we had baby ribs tonight. With a tangy cabbage slaw to balance the richness, the ribs were glorious especially when hot out of the oven and eaten with fingers. I didn't have enough time to bake them until they were falling off the bones but my mom could eat them without pulling her teeth out. Do not trim the fat off baby back (a.k.a loin ribs) ribs. There's not much fat anyway so this isn't too sinful a meat to eat. Whatever fat on the ribs turn into tasty, flavorful burnt-on-the outside-soft-tender-inside bits of heaven after an hour of baking. I hear "Yay!" Update 21/6/11: I went to the butchers and realized I made a mistake about where the ribs are cut from. Baby back ribs are not cut from the belly area but from along the loin. One side of the loin gives thicker, harder ribs but the other side gives smaller ribs and those are baby back ribs. Should've known, "back ribs" are from the back. 1. Oven at 180 C. Put everything except the ribs into a small sauce pot and boil until thickened. 2. 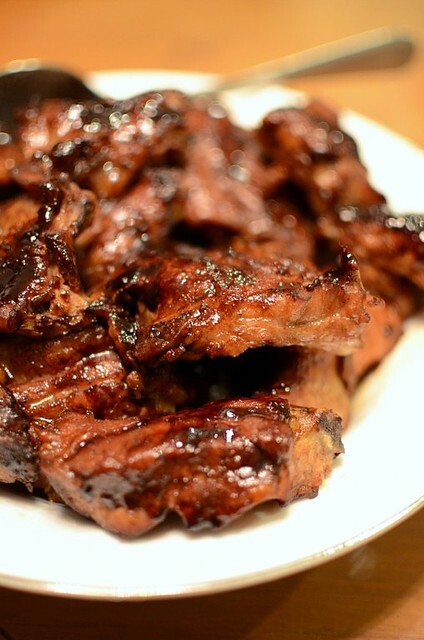 Dip each piece of ribs into the sauce and then place onto a baking tray, close together to minimize drying out. Drizzle about 2 T veg oil all over the ribs. Bake for at least 1 hour or 1 1/2 hour longer if you have the time but at 160 C and increase to 180 C for the last 15 minutes to brown. 3. About 40 minutes into the cooking, take tray with ribs out and dip each rib in the sauce again and place onto the baking tray, turning ribs the other side up. After 10 minutes, add 3/4 cup water to the tray (depending on the size of your tray) so that you get extra sauce for eating the ribs with rice and the tray wouldn't have a burnt crust but it's up to you. There should be some sauce (about 2-3 T) remaining in the pot. 4. While ribs are cooking, heat the remaining sauce under low heat until very thick. 5. 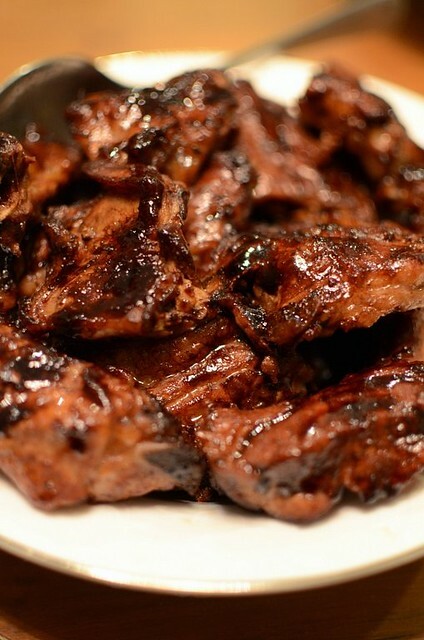 Remove tray of ribs from the oven, brush the thick sauce over the ribs and serve immediately. I have a new love. It's the Nikon D7000, a present from Hub. Only three days old and baby and I are still getting to know each other. We have 3 of those film Canon SLRs sitting in the cabinet but this is my first DSLR. As you know, most of my photos are taken with the Panasonic Lumix FZ 50, a great point and shoot camera that has given me excellent shots, especially in color and clarity. 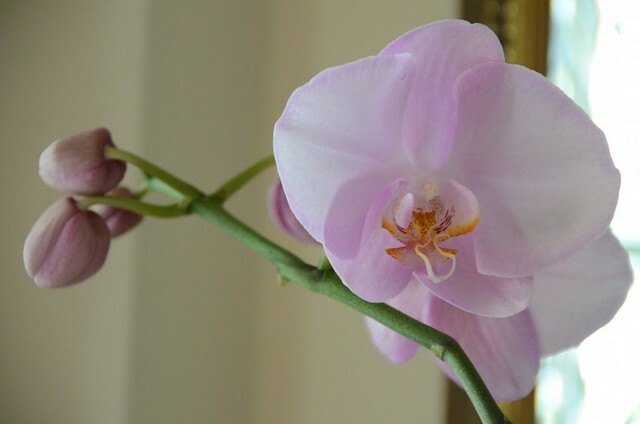 Some of my photos are taken with my daughter's Nikon D90 whenever she's around. Why did I choose the Nikon D7000? Well, it has received excellent reviews, is affordable and not too daunting to handle although I suspect that I'll probably use only 1/10 of its features. For years, I resisted the upgrade to DSLRs because I didn't like their size and weight. The new Nikon D5100 is perfect in size and features because honestly, I am too amateur to play with anything above that. But I was afraid I'll outgrow the D5100. The D7000 is just nice, not too low or too high for an amateur. Why Nikon? Now that's truly a million dollar question. I love asking people if they are Nikon or Canon people. They usually hesistate, like it's something they never thought about. The world is split into either Canon or Nikon DSLR people, I've found. Asians love Canon DSLRs (in Europe, I saw that Nikons outnumber Canons 9 to 1) and I always thought it was because Canon cameras have more features for the same price (value for money), are more trendy and of course, Canon has many terrific lens (I find Canon lens give brighter, whiter colors while Nikon colors tend to be a bit mellow). Then I read that Canon cameras are preferred because in Malaysia, the cameras are made and assembled in Japan while Nikons are made in Japan and assembled in Thailand. That did disappoint me a bit although I overcame that by trusting in Nikon's quality control. If you are the premier camera maker, you wouldn't risk your reputation churning out lousy stuff. I knew that if I bought a Canon, I'll always covet a Nikon. Way back in uni, my roommate and I took a summer course on film development and we both yearned to own a Nikon SLR because in those days Canon didn't have the same ranking as they do now. The funny thing is CY did get her dream Nikon SLR while I ended up with several Canon SLRs because I married a Canon man. But now CY is using a Canon point and shoot ( I too prefer Canon p & s over Nikon's) in the Mayan ruins and the River Kwai while I now own a Nikon DSLR. So why did I choose a Nikon, other than to fulfill one of the desires of my youth? I asked 3 camera shop keepers and all three said they prefer Nikon. One guy said he started with a Canon DSLR and "then I handled a Nikon. I felt the difference"--a comment I've heard over and over again. But then this is not about Nikon vs Canon because ultimately, both make great cameras. It's a very personal choice. The Sigma lens gave very nice outdoor color I think. From a distance in low light, no tripod. In low light at night at ISO 5000, no tripod. Over exposed but still, no black mess. In my dark storeroom, ISO 800. Wow. I love the 35mm lens, so much that I couldn't fall asleep last night because I couldn't wait for daylight to shoot with it. The best thing about the D7000? It handles low light extremely well. It has an ISO of 6400, a big improvement for a camera that's not in the professional league. I don't know how to correct the white balance yet. You can edit the photos on the D7000 but that really is rocket science to me. I haven't taken any food photos yet; I'm delaying the gratification until I cook something special. I promise I'll have at least one nice post next week. Excuse me now because Baby is calling. 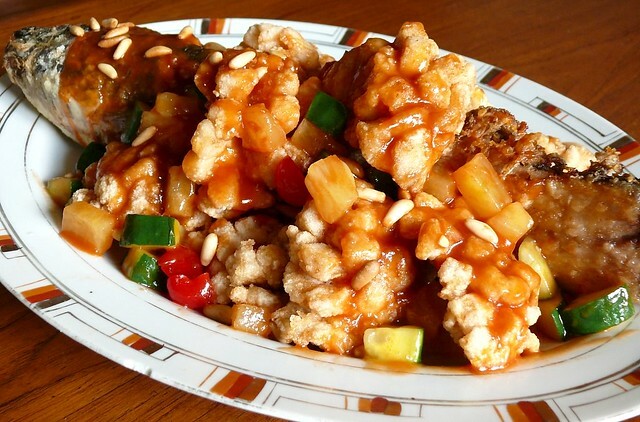 One of the most typical Chinese dishes, especially in western countries, is sweet and sour pork (gu lao rou) which becomes sweet and sour fish when the pork is replaced with fish. 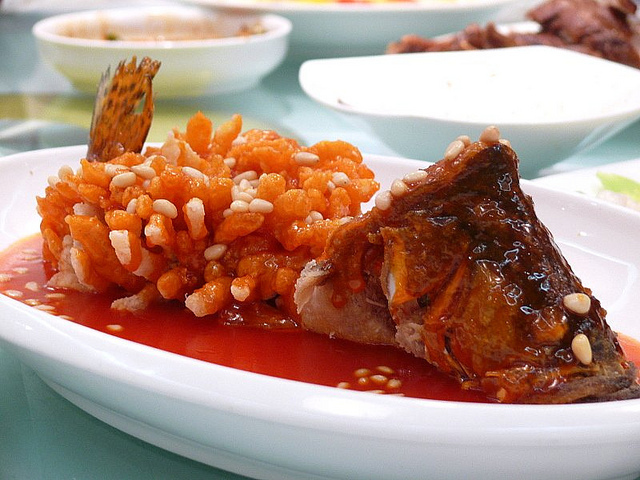 Gourmets of Chinese food know that if the waitor recommends sweet and sour fish, especially fish slices and not whole fish, the fish is likely to be frozen or not fresh enough for steaming because for the Chinese, fresh fish is live fish. Smothered with sweet and sour sauce, frozen or fish that's not so fresh can be disguised because the taste is diverted to the sauce. If your hosts order steamed fish, you know that the fish is very fresh because only fresh fish can stand up to light steaming with minimal ingredients. That said, sweet and sour dishes are very popular, usually with kids and those with less discerning taste buds. I do enjoy sweet and sour fish once in a while because we eat steamed fish at least once a week and it gets boring. This sweet and sour fish is based on a beautiful (in sight and taste) dish I ate in Shanghai last year. I couldn't get the flesh of the fish as elegantly opened like a coral or flower because I wasn't sure if the flesh'll fall apart if I cut it too finely. It was fun though to cook this dish. Put on an 'antique' ceramic plate from my mom, the fish looked restaurant-worthy. It was delicious too except that I was a little bit disappointed that the salt-water fish didn't have that special flavor found only in those fresh-water fishes of China. 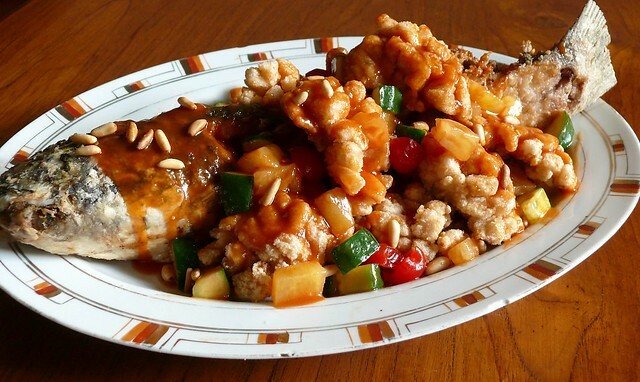 Again, in my opinion, sweet and sour fish is more about the fried flavor and the sauce. All-in, still, a delicious and showy dish that is good for festive occasions. * if using canned pineapple, I substitute the water with the water from the can and decrease the sugar to 1 teaspoon. 1. Clean and scale the fish. Wipe dry with paper towels. Remove the fillets (keep the skin on) and feel for the bones with your hands and remove them. Season the fillets and fish skeleton lightly with salt and pepper and massage them with beaten egg white . Turn the fillets flesh-side up and cut diagonal lines 3/4 cm apart deep into the flesh and to the skin but don't cut through. Cut diagonal lines in the opposite direction to make a diamond pattern. Cut the fillets into 4 x 6 cm slices and thoroughly coat the flesh, opening it up and getting all the cut sides. Coat the fish's skeleton and head with cornflour. 2. Heat about 5 cups of oil for deep-frying. When oil begins to smoke, fry the fish's skeleton until golden and arrange on an oval plate. Now fry the fillets in 2 or 3 batches until crispy and golden. For prettier results, open up the flesh neatly so that they spread out. Arrange the fried fillet pieces around the skeleton. 3. Pour all the oil away and add the sauce ingredients and the veggies to the wok or frying pan. 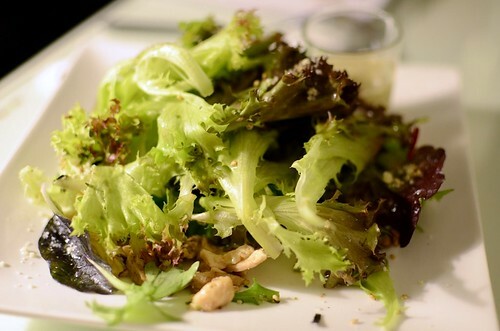 For a more classy looking dish, omit the veggies and use pinenuts to garnish. Cook over medium heat until thickened but not too thick. Add some water if it gets too thick. 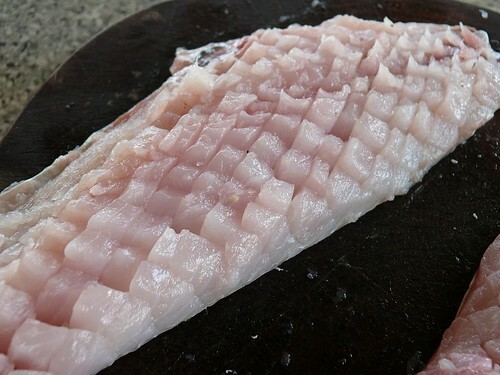 If you want a shiny sheen, add a tablespoon of the oil from frying the fish to the sauce and stir well. Season to taste if necessary. Pour the sauce over the fish and sprinkle pinenuts all over.